Vault 88’s strict policies and rules doesn’t stop merchants and other creatives from expressing their individuality. One of the most aspiring entrepreneurs in there is one who can really make a difference, if allowed to flourish. Coco: What can I get you? RR: An interview, please. Hehe. If you don’t mind. Coco: There’s not much to say. I’m Coco. I sell stuff that people wear. Mostly hats. Only hats, really, since people are required to wear that ghastly suit. RR: I can see how that limits the selection. Coco: Well, I try to make it as interesting as I can. In addition to offering the regular selection and repairs, I’m doing my own custom designs. They sell better than the standard stuff. Shows that people want things that stand out, and not the same boring, conformist stuff. RR: I hear ya’. Variation is life’s spice and flavour. 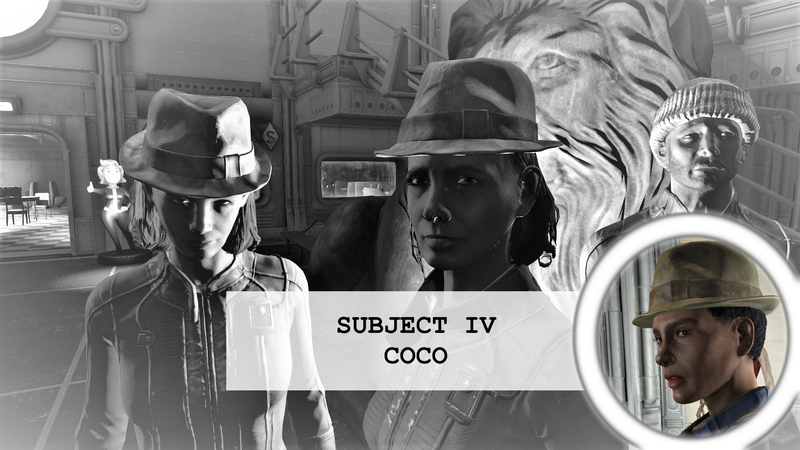 Coco: I’ve been thinking of branching out, doing something about the vault suits, but have to get approval from the Overseer first. Speaking of which, I have to get up there and give my daily inventory list. RR: OK, thank you so much for the interview. Good luck with your plans. Coco: By the way, if you see billy, tell him his new skull-bandana has arrived. It’s interesting to see how limiting policies can be on someone’s talent. The Overseer’s yearning for control keeps the community in order, but not without sacrificing liberty, and perhaps progress.